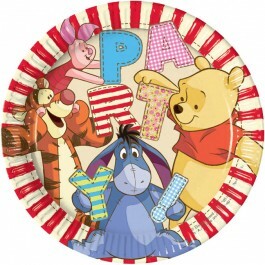 Celebrate your little one's first birthday with a Winnie the Pooh party that is sure to delight. All at once charming and adorable, Pooh bear has been delighting the young and young at heart for decades. 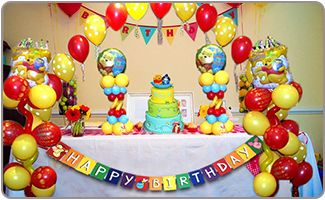 Here is a collection of Pooh 1st birthday ideas in India to assist you in hosting an amazing party. Scale back your guest list. Keep the guest list to immediate family members and a few close friends. This will also help to keep costs down, and reduce planning stress. Plan the party either for late morning or later in the afternoon, around nap time. This way, your little one is able to thoroughly enjoy the party, without missing naptime. A missed nap can result in a very cranky baby. Host the party on a weekend so that family and friends will be able to attend. Keep the party short and sweet so that the little ones don't get overwhelmed and overtired from all of the festivities. An hour or two at the most should be all you need. Recruit help with the party planning and on the big day itself. Older siblings and cousins can help to keep the little ones entertained. 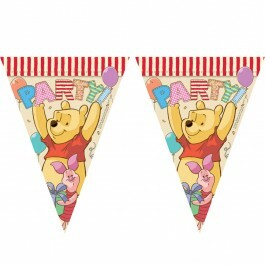 Order your Winnie the Pooh Party supplies atleast a week in advance so that party planning becomes easy and exciting. Ask your close friends and family members if they mind preparing some of the snacks; even if you reimburse them for the costs, it will save you valuable time as you plan the Winnie the Pooh party. If the weather will be agreeable, host the party outdoors. This will contain any mess outside, and make cleanup a snap. Create a baby-safe play zone that will contain the birthday boy or girl, and any of their guests who may perhaps still be crawling or toddling. Fill the area with age-appropriate toys and provide plenty of seating for the supervising parents. Plan your menu as far ahead of time as possible so that you can ask guests if there are any food allergies to be concerned with. It is always prudent to first check before serving up a platter of fish fingers or peanut butter cookies. 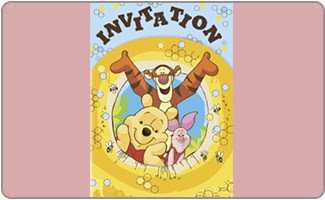 Winnie the Pooh birthday invitations will introduce your guests to the theme of the party, with just the right touch of grace and style. Save time and purchase ready-printed cards that are a perfect match for the other Winnie the Pooh party supplies that you will use to decorate. 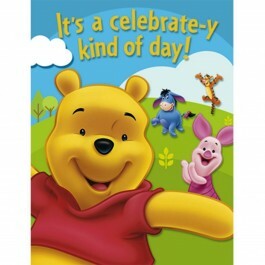 If you are feeling crafty, you can design a birthday card that includes the number one, birthday child’s photo and a few great stickers of Pooh bear. With a hot glue gun and crafting supplies, you can create mini masterpieces for each guest. Have your little one's first birthday photos done a little bit early and select your favorite picture to be used on the birthday invitation. Add a fun and brightly colored background, along with a sweet poem about your darling, and you'll be all set. Include a map to your home, an email address, and of course a phone number with each of the invitations. This will ensure that your invited guests can reach you to RSVP. Include a link to a birthday registry so guests can select a gift for your little birthday boy or girl. If you would prefer no gifts then be sure to note on the invitation that their presence at the party is gift enough. Emailed party invitations can save time but definitely lack the personal touch. Stick to invitations that can be posted on family schedules and fridges as a reminder. One year olds are somewhat limited in their attention span, so standard party games may not be the best choice for this party. Provide the little ones with age-appropriate flash cards and colorful picture books. 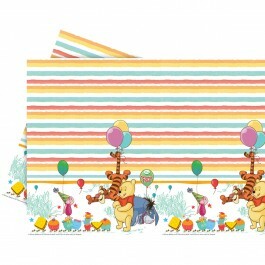 Picture books with Winnie the Pooh would be especially great for this Winnie the Pooh 1st birthday party. 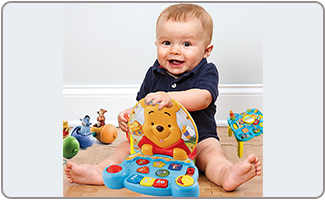 Plan Winnie the Pooh party games and movies to entertain the older kids. Fun games that include singing, dancing, and silly facial expressions, like Peek-a-Boo, are a great idea. Offer the little ones toys or hand them Winnie the Pooh toys if you have any to encourage them to engage with you, like pots and pans with wooden spoons. Kids love to make a noise, so let them make their own music. Ensure the return gifts are age appropriate. 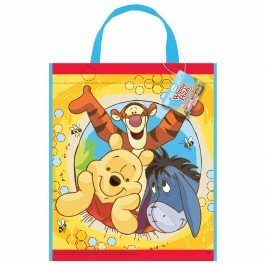 Have return gifts for the older kids and Winnie the Pooh return gifts for the little ones. Stickers and picture books are fun and inexpensive. Bath crayons and bubbles also make great return gifts everyone can enjoy. 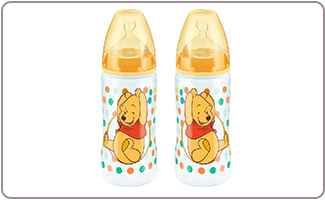 Winnie the Pooh sipper cups, Winnie the pooh party hats and kid-safe utensils are a great choice. Age-appropriate snacks are also a great choice for return gifts. 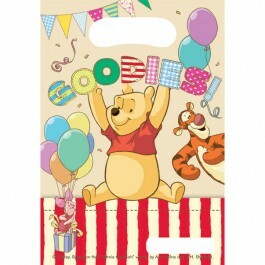 Use Winnie the Pooh themed party bags and ensure that guest's names are on each bag. Include a thank you note and encourage guests to share any photos they clicked. Keep the foods simple in order to cut down on your prep time, clean up, and of course on your budget. Finger foods for the little ones are a must-have. Again, ensure that you have asked about food allergies. Stick to soft sliced fruit, small sandwiches, and other small items that are appropriate food stuffs for one year olds. Mini pizzas are also a great choice for a first birthday party, and will allow you to easily include pizza to serve up to the adult guests. Offer simple adult choices that could be as simple as deli-made sandwiches and fruit trays, or could even include burgers and hotdogs thrown on the grill. Don't use your fancy china and real cutlery. 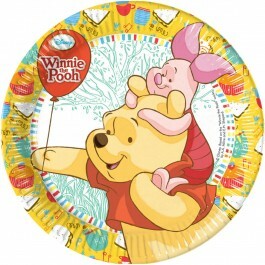 Purchase coordinating Pooh 1st birthday plates, cups, and napkins. Serve food on serving dishes that can be easily covered with plastic wrap or a fitted lid at the end of the party. Schedule the cake festivities towards the end of the party as this is likely when the little ones are going to get the messiest as they dive into the frosting. 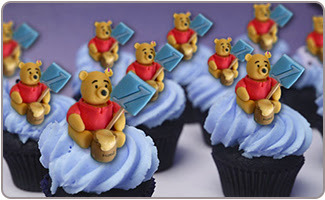 Considered frosted Winnie the Pooh cookies cupcakes, cheesecakes topped with Winnie the Pooh cake toppers to charm and delight the little ones. 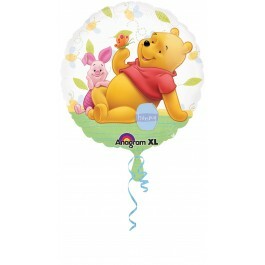 Kids love balloons, but consider avoiding latex balloons due to the potential choking hazard and opting for Mylar balloons, especially Winnie the Pooh balloons. Hang a 1st birthday banner up on the wall or between doorways. Toss streamers between lamp fixtures to add a splash of fun color to the party room. 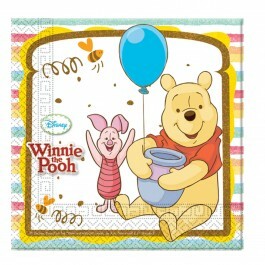 Decorate the table with the Winnie the Pooh themed tablecloth. Ensure that snack tables are also covered with easy to wipe down tablecloths. 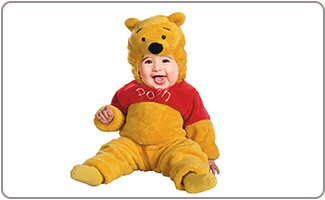 Use Winnie the Pooh wall decals to decorate the party room, and consider a blown-up image of your birthday boy or girl in a Pooh bear t-shirt. Put kid-friendly music on, at a soft-level, to lend a fun and kid-friendly ambience to the party. You can consider store bought Winnie the Pooh decorations to cut down on your preparation time.